Roughly 10 months ago, immediately after union bosses had spent an estimated $12 million to retain control over the Missouri governorship so they could perpetuate compulsory union dues and fees in the Show Me State, voters sent Big Labor a clear message. By a solid margin, Missouri citizens voted to make unabashed Right to Work supporter Eric Greitens their next chief executive, and reject union-label gubernatorial candidate Chris Koster, then the state’s attorney general. This February, the Missouri Legislature and Greitens fulfilled the mandate they had plainly been given by the voters of the state. Lawmakers passed, and Greitens signed, a Right to Work measure prohibiting the termination of employees for refusal to join or bankroll an unwanted union. Unfortunately, it now seems inevitable that the freedom-loving Missourians who fought for years to pass a state law revoking union officials’ forced-dues and forced-fee privileges will have to refight the entire battle over the next 14 months. Even before forced dues-repeal legislation was adopted by the Missouri House and Senate, Big Labor had launched a multi-million-dollar campaign to circumvent elected lawmakers and kill Right to Work in the cradle. Top union bosses are justifying the campaign, funded largely by forced dues and fees extracted from employees outside of Missouri, with claims that state voters didn’t know what was at stake in the 2016 elections. Such forced-unionism propaganda is patently false. On Election Day, at the same time they selected the pro-Right to Work candidate for chief executive, Missouri voters returned to office all RIght to Work-supporting legislators in the Missouri House and Senate who sought reelection. No politically sentient person in Missouri could have been the least bit surprised this February 2 when the Missouri Legislature sent S.B.19, the state Right to Work measure, to Greitens’ desk. And every Missourian who even casually follows public affairs must have expected Greitens to sign this bill, as he promptly did. Big Labor’s ongoing campaign to destroy Missouri’s Right to Work law is premised on an obvious lie regarding how it was enacted. But no one should for that reason assume it can’t succeed. 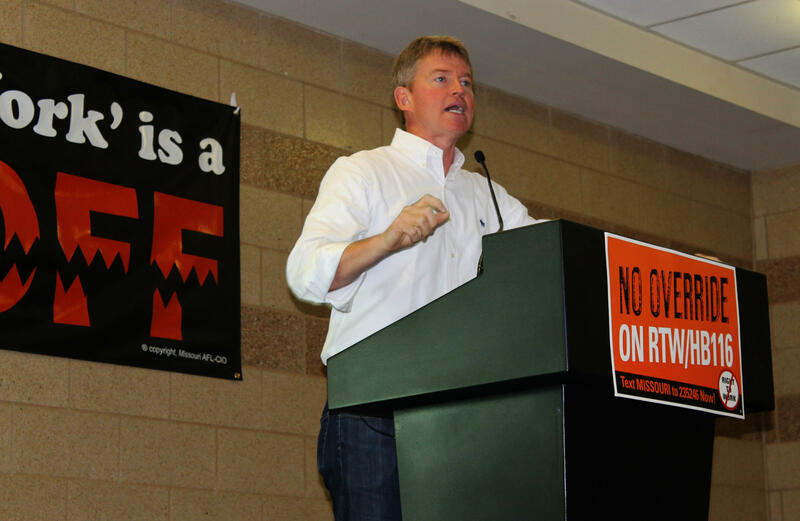 On August 18, the Missouri AFL-CIO hierarchy and a union front organization known as We Are Missouri submitted to Secretary of State Jay Ashcroft what clearly seems to be a sufficient number of petitions to prevent the Right to Work law from taking effect as scheduled and force a November 2018 election to overturn it. Under Missouri law, such petition drives may be used to block enforcement of a recently enacted state statute and mandate an election over whether or not it should stay on the books. It now seems all but certain that a Right to Work repeal referendum will occur next fall. Missouri union bosses are determined to restore their legal power to get workers fired for not turning over part of their paychecks to Big Labor. But they know the Right to Work principle they oppose is overwhelmingly popular. That’s why they will be aiming throughout the campaign to confuse voters about what the law really does. In this aim, union bosses have been assisted by Ashcroft, who rubber-stamped confusing language for the anti-Right to Work petitions and the ballot measure itself. Foundation attorneys are now asking the state Supreme Court to reconsider this misguided ruling, but there is now no way to know if an appeal will even be heard. If the biased language remains despite the best efforts of the Foundation and its clients, the National Right to Work Committee is prepared to put ample amounts of time, money and talent into a campaign to help citizens see through it.